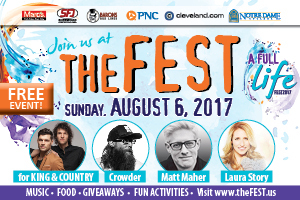 The FEST is a one-day family FESTival sponsored by the Diocese of Cleveland. It is designed to bring thousands together for an amazing family day – for FREE. Join us from Noon until 10pm for activities for your entire family and an exceptional experience. The amazing family day concludes with a Catholic Mass at 8pm followed by an amazing American Fireworks display. Invite your friends and family and join us on Sunday, August 6. All are welcome as we come together for the highlight of summer!